Our expert facilitators utilize a unique, proven process to help you achieve long-term purposeful results. Unproductive meetings cost businesses nearly $37 billion annually across the globe. But what if they could be more effective? We all know the core problems with meetings, and we all dread attending the low-context, no-action-items, meetings-about-having-more-meetings, that regularly seem to pop up on our calendar. It's even become an unfortunate punchline around the workplace water-cooler. When you create the right type of meeting structure for your organization, it can produce exceptional results across the board. Effective meetings occur when team members come together to openly discuss ideas, debate issues, overcome obstacles and develop a shared purposeful plan that drives results. In fact, giving your teams time to step away from their day-to-day routines allows them to focus on the big picture and how they contribute to the overall purpose and mission of the organization. It's hard to do that when your head is down on 14 different tasks and projects. But creating meetings that stay on track and actually produce results can be a challenge for many organizations. Thankfully, we've been facilitating meetings for 20+ years so you can trust that we've got your back! Our TeamWorks meeting facilitation package works for any size team or department, within any industry, whether you have a for-profit or non-profit alignment. In short, we help you create and manage effective meetings to get stuff done, and it's all backed by research, observation, and technology. Identify your purpose, core values, strengths and opportunities and get expert guidance in creating and executing a winning team-based strategic plan. Your TeamWorks Facilitator acts as a positive, neutral, unbiased ally to assist your executive teams, board, managers, sales teams, or front line staff to produce results. With meeting formats ranging from small internal planning sessions to large offsite strategic planning retreats; whatever your organization’s size, culture, or industry a TeamWorks facilitated meeting has the power to help any leader and their team to improve performance. Here's a sample list of the types of meetings our expert facilitators can customize to your unique needs. With our unique computer assisted team-based strategic planning process, we work with your teams to; break down silo’s, encourage collaboration and free flowing discussion, generate innovative solutions to challenges and hurdles, establish priorities, commitment and accountability, all while developing a clear, simple to follow action plan that produces measurable results. Is your team capable of offering more passion, more enthusiasm, more moxie? Teams that suffer from a lack of an On Purpose vision will “go through the motions”, but lack that fundamental drive and enthusiasm your organization needs to catapult you to the next level. Facilitated team meetings help you create a shared, higher purpose and philosophical alignment; leading to stronger cultural bonds and deeper accountability. Your board members are experts in their own right. Tapping into their insights and expertise while ensuring CEO and executive alignment, is vital to the success of your organization. These sessions encourage best leadership practices while retaining good corporate governance. We help you address differing opinions and uncertainty in a common forum, creating a space to develop innovative solutions. Effective and inclusive sales meetings are a critical component of creating a great sales culture. They also provide the perfect opportunity to build skills and motivation. A facilitated sales meeting can help you develop comprehensive team targets, build collaboration while inspiring healthy competition, optimize the skills of each team member and focus their efforts on action items that are positioned for the greatest success. A calculated marketing strategy can drive sales, increase market presence and enhance your brand's overall value to customers. 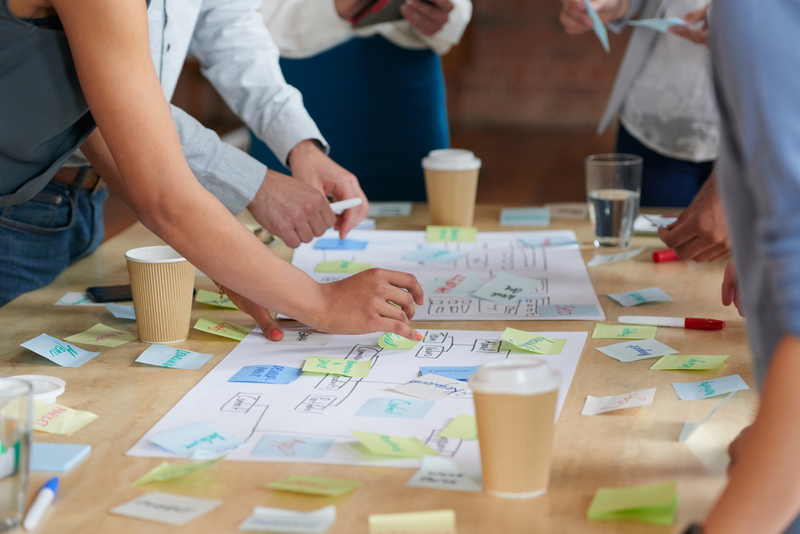 A facilitated marketing strategy meeting helps your team develop a cohesive brand strategy by allowing for creative thinking in a collaborative, systematic environment. Create a clear brand positioning statement, craft your core values and uncover your unique differentiators in meeting designed to cater to creatives and suits alike. Mergers and acquisitions work best when the integration process is holistic, purposeful and well executed. Our facilitators act as a neutral third party to help focus on the best interests of the merged entity. We help you to develop a combined philosophy, set of values and corporate culture based on the greatest strengths of both parties. Uniting team members ensures the development of common goals while reducing the uncertainty and anxiety inevitable during a merger. Does our team-based approach work? Results speak loudest. Read about the results we’ve helped leaders achieve in the case studies below. "We retained TeamWorks to facilitate our strategic planning activities and to help evolve our organizational development. These are extremely important activities concerning the future of our organization. We have found TeamWorks services to be professional, trusted and combined with a high level of flexibility. Their service and quality of work is of a high standard, focused on helping our members and organization to achieve our shared objectives, to be better." "I have known and worked with Max Carbone of TeamWorks on several occasions since 2001. Max delivers a thorough and very professional strategic planning service. He is a very personable and extraordinarily knowledgeable resource. The combination of his interpersonal skills and expansive knowledge across multiple industries allows him to help teams quickly identify the key issues in the business and what needs to be done to set an action plan built for success. He remains a trusted advisor that I can count on during the good and tough times to be honest, challenging and sincere." "TeamWorks helped us conduct critical team research and develop a team based strategic plan. We are very pleased with the research work & the insights we learned from their work. I am pleased to endorse TeamWorks as a professional and effective ally to help any leader grow their business." "We’ve worked with TeamWorks to facilitate our strategic planning work over the last five years. These sessions have helped build our team and given us a focus that has driven fantastic results. Most importantly, we continue to build a strong, positive culture that delivers happy, satisfied customers."